To add style or color to a baby nursery or birthday party you could get Bobee Paper lanterns for Girls. Which is simple and affordable decorations; Bobee lanterns are colorful and fun creating memories for you and your family. 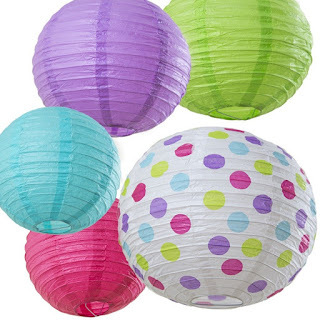 Paper lanterns are a great way to decorate for parties and easier than blowing up balloons. Hang above the cake table, gift table or under a chandelier. They are a festive and quick to put up. Perfect for bridal shower, baby shower, first birthday parties, a garden party, wedding decorations and more! You can even use them outside under a patio cover for summer decorations. Paper lanterns are a terrific feature for room decorations. Cluster above the crib or glider in the nursery. They make a great baby mobile or just to liven up a drab corner in your little ones room. You can even buy LED lighting kits for the lanterns to create a soft light for your room. Colors coordinate your lanterns with the Bobee wall decals and create a custom room design. The colors they come in are pink, blue, green and polka dots. My Opinion: I really like the functional of the paper lanterns with so many options to use them I like the green for a Christmas decoration since it is plain you could draw on it or decorate to make more festive.